Co-written with Kyle Mensing, an economics grad with a creative bent who is trying to merge business and social. Our intrinsic understanding of opportunity cost is what defines us as people. Our preference of city to country, work to play, beer to wine, restaurant to home cooking, video games to books, television to the outdoors, football to soccer, golf to baseball, etc. Is this notion of opportunity cost sometimes the key to successfully determining the value and ROI of social media? All of these numbers should be taken with a grain of salt, as we looked them up quickly on Google. This is just to prove a general point. As companies start embracing social media they rightfully want to understand what they are getting for it. They want to know what their ROI will be. But the “R” in ROI doesn’t always have to equal net new dollars via sales. Social media can deliver other returns that have meaningful and measurable financial value. The average Facebook page has 4,596 fans. Let’s say a company decides to use Facebook as a market research tool. Let’s say 5% of those 4,596 fans give actionable feedback. That would be the equivalent of 230 interviews or roughly 78 focus groups. Because most Facebook interactions are abbreviated and cursory, let’s assume that this would be quantitative interview-level data gathering only, valued at $80 per person above. Consequently, by asking your Facebook fans to participate in your market research program, you are potentially generating $18,400 worth of equivalent research value. Assuming you haven’t spent gobs of money incentivizing your customers to “like” you on Facebook, you might be able to generate a positive ROI on your Facebook presence through a single research project. Let’s do note for the record, however, that market research on your Facebook page is not a random sample, and has other methodology issues. That doesn’t make it invalid, just not a direct apples-to-apple comparison. Consider Domino’s Pizza. 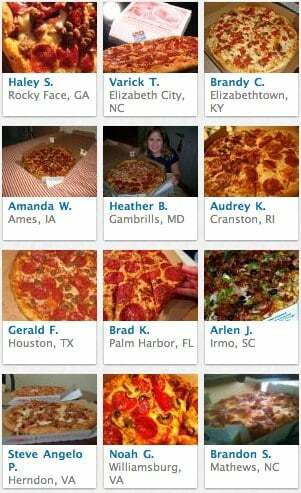 Domino’s has undergone three campaigns to collect photos of actual pizzas from real customers. Participation incentives were minimal – a chance to win $500 and the potential to have your picture used in a commercial. (these incentives are much lower than for traditional research, where all participants receive some type of compensation in nearly every case. In the third version of this program alone, Domino’s received 3,569 submissions. They chose 20 winners for a total payout of $10,000. Again, if we assume that the collected data was mostly quantitive in nature, and we value that at $80 per respondent, Domino’s generated approximately $295,520 in research value, in exchange for an investment of $10,000 in incentives, and some program creation costs. On a smaller scale, extreme mountain bike tour company Sacred Rides asked their Facebook fans to weigh in with ideas and comments about their new mountain bike jersey design. Nearly 162 comments were provided during two rounds of feedback. Being able to tap into robust customer comments quickly and easily is a huge advantage for a small company. No emails with photos of the jerseys. No sending out photographs via snail mail, or conducting follow up telephone calls. We need to start moving beyond basic-level interactions such as clicking “follow” or “like” and instead start activating fans and asking them to provide richer insights that can help us build wow-worthy products and services.